Hidden amongst 28 and a half acres of breathtaking natural beauty and wrapped around a private bay, the hotel is renowned for its privacy and tranquility, its passionate love for the environment and last but not least, the friendliness of its staff. 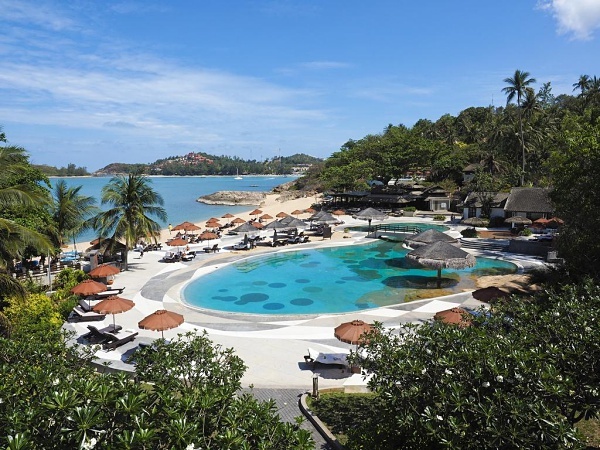 Since opening in 1987, The Tongsai Bay has established itself as the leading family owned hotel on the tropical island of Koh Samui, Thailand. Hidden amongst 28 and a half acres of breathtaking natural beauty and wrapped around a private bay, the hotel is renowned for its privacy and tranquility, its passionate love for the environment and last but not least, the friendliness of its staff. 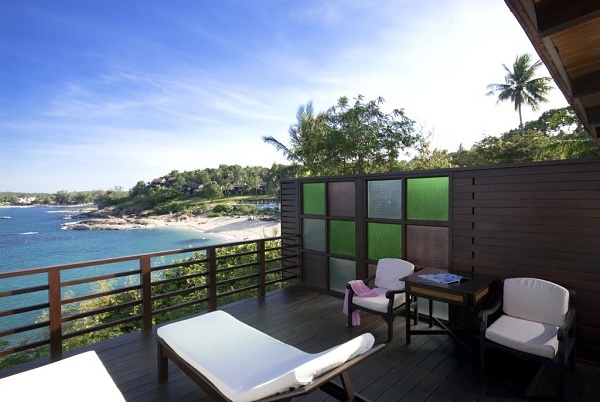 The Tongsai Bay is a 10-minute drive from Samui Airport and a 15-minute drive from Chaweng Beach. Set within lush tropical gardens on a hillside overlooking a secluded bay, accommodation at The Tongsai Bay consists of 83 suites, cottages and villas. 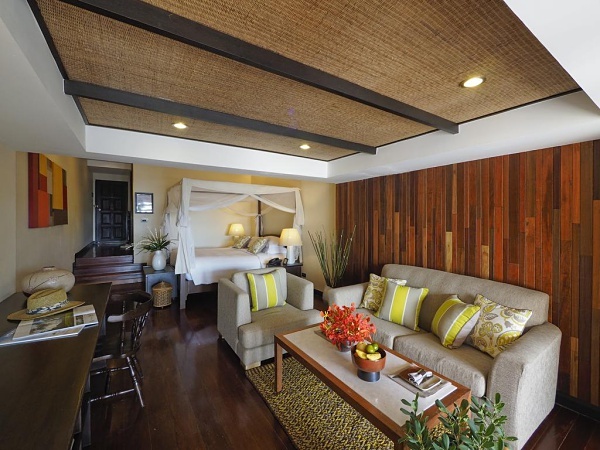 All rooms offer ocean views and boast spacious terraces, enabling guests to enjoy and connect with their tropical surroundings. The Beachfront Suites (72-86 sqm)are located in the 3-storey building nestled behind the main pool. All enjoy direct pool and sea views. 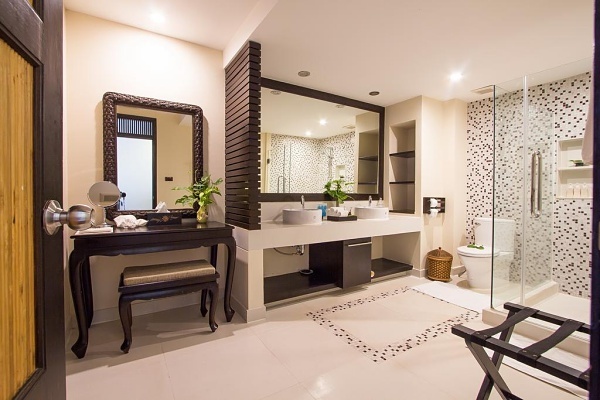 The ground floor rooms have an oversize indoor bathroom, terraces complete with sun-loungers and have direct gated access to the pool area and gardens – ideal for families with children. The two upper floors all have the signature “bath-with-a-view” on the terrace, sun loungers and a dining/writing table for 2. 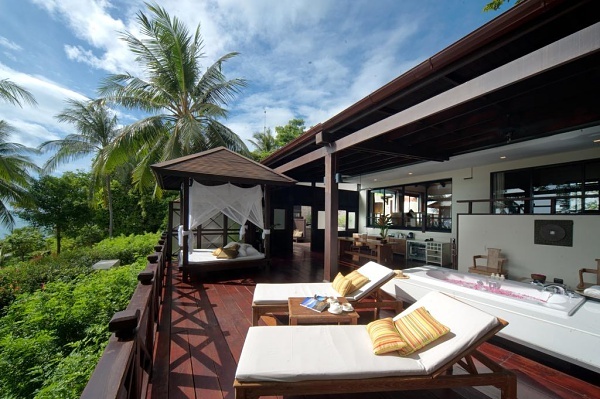 The Cottage Suites (68-78 sqm) stand among coconut trees and tropical gardens on the hillside overlooking the sea. Most are semi-detached with a split-level design of bedroom and living area. To capture the very best sea views the cottages are all slightly different in shape and arranged on different levels. Each has a private open-air balcony complete with our signature “bath-with-a-view”, 2 sun-loungers and a dining table for 2. The Seafront Cottages (68-78 sqm) have the same design and facilities as Cottage Suites including the signature "bath-with-a-view" and are located on the front row of the hill and bayside, allowing for beautiful sea views and privacy. The interior boasts a split-level design of bedroom and living area. Set among the Cottage Suites (88-98 sqm), coconut trees and tropical gardens on the hillside, all 5 Pool Cottages offer a private plunge pool on the open-air balcony, complete with the signature “bath-with-a-view”, 2 sun-loungers and a dining table for 2. The interior boasts a split-level design of bedroom and living area to capture the very best sea views. The McGuigan Cottage (141 sqm) has a spacious balcony featuring pool, dining table, 4 poster gazebo with mosquito net, our signature “bath with a view” and 2 sun-loungers. 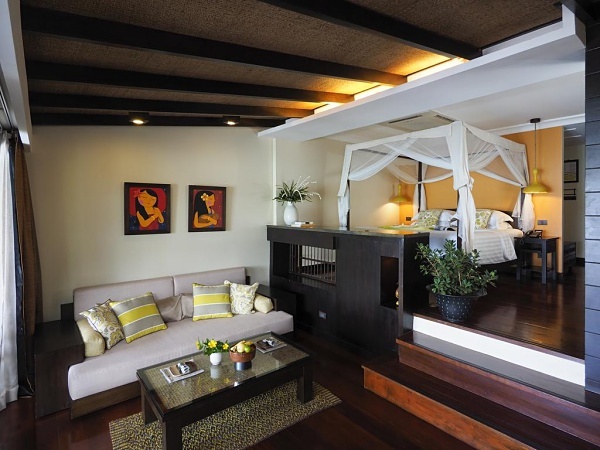 The interior boasts split level bedroom with four poster bed and generous lounge area. The views encompass both sea views, The Tongsai Bay Beach itself and beyond. The individual Hideaway Cottage (120 sqm) is tucked away in isolation from the rest of the resort and offers unsurpassed sea views and privacy. Although the golf carts will take you most of the way, please note that there are a few steps to negotiate to deliver you to this private haven. On the terrace, in addition to the signature “bath with a view” and 2 sun loungers it has a large table and an outside four-poster gazebo complete with mosquito net. The Viewpoint Family Cottage (160 sqm) for up to 5 adults, is the ideal family suite with 2 bedrooms each with its own lounge and bathroom - one a double bed and the other with twin beds. 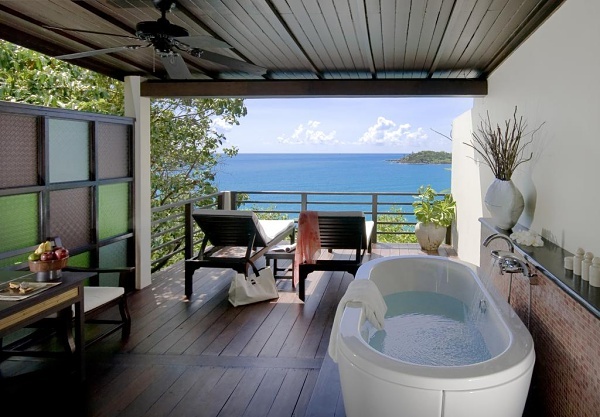 There are 2 of the signature “bath with a view” bathtubs at each end of the L – shaped balcony. The cottage is located at the top of the hill with a few steps to negotiate, however, the spectacular sweeping views make up for the extra walk. The Tongsai Pool Villas (180 sqm) are located on the 2nd row that forms the Tongsai Grand Villas. Each villa features a vast open air terrace complete with signature “bath with a view”, 4 poster gazebo with mosquito net, bar, dining area and sun loungers. 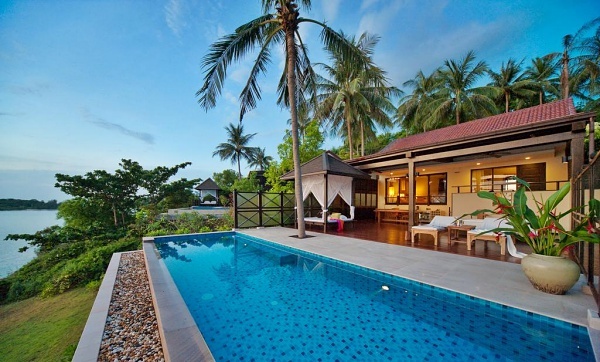 All villas have sea views, private pools and allow for a sense of privacy and tranquility. Two adjacent villas can be linked for larger families or friends travelling together. The Seafront Pool Villas (189 sqm) are located on the front of the 2 rows that form the Tongsai Grand Villas. Each villa features a vast open air terrace complete with signature "bath with a view", 4 poster gazebo with mosquito net, bar, dining area and sun loungers. The sweeping sea views beyond the private pool are far reaching, allowing a sense of privacy and tranquility. The Akorn Villa (264 sqm) is named after the hotel's founder, and is the largest villa of which more than half comprises a vast terrace with large L-shaped pool. It has two bedrooms – a double and a twin, each accessible from the terrace itself. 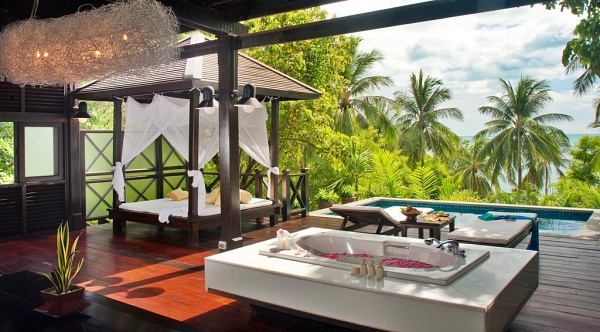 This villa features our open air signature “bath with a view”, 4 poster gazebo with mosquito net, bar, dining area and sun loungers. The sweeping sea views beyond the private pool are far reaching, allowing a sense of privacy and tranquility. Atop the hillside, the Nang Gong Villa (244 sqm)features a vast open air terrace complete with signature “bath with a view”, 4 poster gazebo with mosquito net, bar, dining area and sun loungers. The private pool overlooks the neighbouring Choengmon Bay allowing for the most sweeping sea view of all the room types at The Tongsai Bay. The interior boasts a large lounge and views from the bedroom look over the pool and neighbouring beach and bay. Prana Spa features a relaxing menu of herbal baths and massage treatments. For a refreshing workout, guests may exercise at the gym or play a game of tennis. The resort also provides on-site water sport facilities for guests' enjoyment. The main free form 50 metre fresh water pool and separate children’s paddling pool area both offer, sun-loungers with parasols and side-tables. Sunbeds also flow just metres from the main pool onto the beach sand. Even when the hotel is full there are more than enough loungers and parasols for everyone, so there is no need to reserve. The Beach Boy team is on duty from 9.00 to 19.00 to provide you with fresh towels, bar drinks plus complimentary iced drinking water. The hotel has a Green Policy.